Description: The property is situated in the village just 7km from the market town of Dobrich and approx 42km to the beach, and 48km from Varna airport. Impressive one storey rural house located in a quiet and unspoilt village. The village is ecologically clean. There are great panoramic views. The area is very suitable for outdoor activities such as hiking, hunting and fishing. The property is just 300 m away from a big fishing lake. 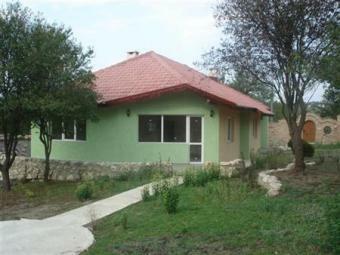 Newly built 3 bedroom house with fireplace in Authentic Bulgarian Style. The house is one-storeyed, 120 sq. m. in area and comprises of living room with American style kitchen with fire place, 3 bedrooms, and 2bathrooms with WC. Outside you have a wonderful terrace with built in stone BBQ. The house is completed with PVC windows, roof construction type `Bramak`, double glazed windows, a fire place built in Greece style, high quality terracotta and laminate flooring, fully finished and fitted bathrooms, heat insulation. This spacious property boasts its well maintained garden 1200 sq. m, with barbeque built in traditional Bulgarian style, a water well, greenery and hardwood entrance gate. The garden is large and enough to have swimming pool or another house. The property is enclosed with brick walls with attractive decorations. The house is ready to move-in after furnishings by your personal taste. Connected to the property is mains water, electricity, septic tank, with telephone and ADSL Internet available. There is convenient bus transport to Dobrich town. The village is well arranged offering blue skies and clean air. This is the ideal place to escape from the overpopulated resorts and enjoy the still untouched from the man nature in private. Built in impressive combination of traditional Bulgarian and Greece style this house is perfect for holiday home!